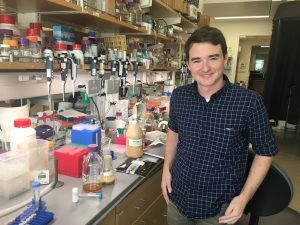 Early in 2017, Ryan Protzko, then a doctoral student in biochemistry at UC Berkeley, was working on research to turn orange peels into eco-friendly bottles and contacted a citrus juicer in California’s Central Valley. Would the company be able to spare some orange peels? Yes, responded the representative, the juicer could truck “a couple tons” of wet navel peel to Protzko’s lab free of charge. Protzko, co-founder of the green chemistry startup ZestBio, tells this story to widen people’s eyes to the gargantuan amount of agricultural waste produced on Earth. Up to 50 percent of citrus fruit, potato, sugar beet, and grape weight is made up of wasted matter: peels, pulps, and pomace—and that matter comprises only 10 percent of the crops’ value. In numeracy, citrus pulp and peel alone generate 10 million metric tons of waste worldwide every year. Much of it is reused as feed to cattle, but this requires an energy-intensive process. Peels that are not dried can end up in piles of putrefying waste that cause environmental damage to local waterways and release greenhouse gases, particularly methane. It makes one guilty to drink a glass of orange juice. Nonetheless, the free citrus pulp offer was confirmation for Protzko and his ZestBio partners—Luke Latimer, who received his PhD in chemistry from Cal in 2017, and UC Berkeley Bioengineering Associate Professor John Dueber—that the raw materials they needed were more than available. What they also soon discovered was that agricultural producers are keen to collaborate on green chemistry products which repurpose their waste, increase their crop value, and reduce emissions by repurposing peel, pulp, and pomace for viable and especially non-oil-based products. That academic paper demonstrated the possibility of using engineered yeast to convert pectin-rich orange peel waste into plastic bottles. It is an advance enabled by the last 10 years of metabolic engineering, says Protzko. ZestBio’s goal is to use yeast to make chemical building blocks, which include the plastic polyethylene furanoate (PEF)—a bio-based plastic produced from agricultural waste. The team is one step closer to that goal, as demonstrated in a November 2018 Nature Communications paper, in which the researchers solved challenges associated with engineering a microbial strain to convert pectin-rich hydrolysates into commodity and specialty chemicals. The Nature Communications paper lands a week after one of California’s most extreme environmental disasters—the Butte County fires, which have been attributed to fossil fuel-driven climate change and which covered the Energy Biosciences Institute in smoke the day of the ZestBio interview. Among the advantages of PEF, says Protzko, is reducing reliance on its chemical cousin, polyethylene terephthalate (PET), found in food packaging and plastic drink bottles. Indeed, when it comes to bottles, an environmentally sustainable solution is in demand. A Pacific Institute study found that approximately 17 million barrels of oil equivalent were needed to produce the plastic water bottles consumed by Americans in 2006—enough energy to fuel more than one million cars for a year. The cell and molecular biologist from Baltimore did not always see himself as an entrepreneur. It was his co-founder and fellow doctoral student Luke Latimer who pushed him to see their PEF research as a business. Their first step, says Protzko, was to apply to the Big Ideas student innovation contest in the fall of 2016. Latimer and Protzko submitted their pre-proposal in November 2016 and were assigned an advisor, Tony Kingsbury, from the plastics industry, “who was really great about letting us know what challenges we’d be looking forward to. He forced us to think about different products.” The ZestBio team won first place in the Energy & Resource Alternatives category in May 2017. Since that time, ZestBio has received pre-seed capital from the National Science Foundation’s SBIR/STTR program and is participating in Berkeley’s prestigious Skydeck accelerator program. The ZestBio team is in conversation with Method and other green products formulators to share research information on its bottle composition process and household cleaning ingredient possibilities. The team aims to have its bio-based bottle on the shelf in five years. In 10 years, says Protzko, the team wants to expand its production beyond eco-friendly bottles to include different vegetable processing and products for multiple producers.